Jack Whitten included in Apparition: Frottages and Rubbings from 1870 to Now, co-organized by the Hammer Museum, Los Angeles, and the Menil Collection, Houston, curated by Allegra Pesenti. 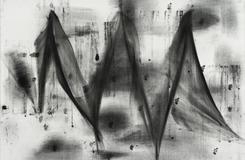 Apparition: Frottages and Rubbings from 1870 to Now is the first museum exhibition to present an in-depth and comprehensive survey of a versatile technique that is both deeply rooted in art history and intrinsically current. Works by approximately 60 artists are featured in the exhibition, which is divided into thematic sections. A dynamic installation aligns works by under-recognized artists with those of well-known figures, as well as objects created for different purposes, in scales ranging from the minuscule to the monumental. The eclectic yet singularly focused selection demonstrates the multifaceted ways in which artists have played with this technique, using it to expand the traditional boundaries of draftsmanship.